City and Country opened in the autumn of 1914 in a three-room apartment in New York City’s Greenwich Village. 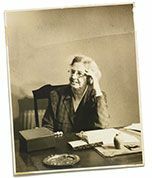 Soon after, Lucy Sprague Mitchell joined Pratt in her work, offering financial assistance that afforded larger quarters for City and Country’s schoolhouse, along with her own teaching expertise. The School moved to buildings purchased by Mitchell (and later sold to the School) on West 12th and 13th Streets, where it remains today. Caroline Pratt believed the use of open-ended work materials offers children the opportunity to recreate the world around them and dramatize the events occurring in it. The wooden unit blocks she developed for City and Country children ages two through seven were widely admired and copied. The School’s basic materials and developmentally driven pedagogy attracted national interest and acclaim from many advocates, including noted educator and reformer John Dewey. Encouraged by Dewey and other progressive educators, Pratt and her teachers began a practice of documenting their work in unprecedented detail. A full century of observation and practice provide the framework for the integrated curriculum employed today. City and Country School’s philosophy and educational program continue to exert an important influence on educators nationwide and globally. Caroline Pratt's memoir, I Learn From Children, which recounts the creation of the School and the development of its unique approach to learning, is used as a guide to progressive education around the world. The School receives frequent requests for observational visits and opportunities to conduct workshops using our materials and premises. Our educators are asked regularly to speak about their teaching methods. The dynamic nature of Caroline Pratt’s educational legacy makes City and Country’s program as relevant today as it was 100 years ago.